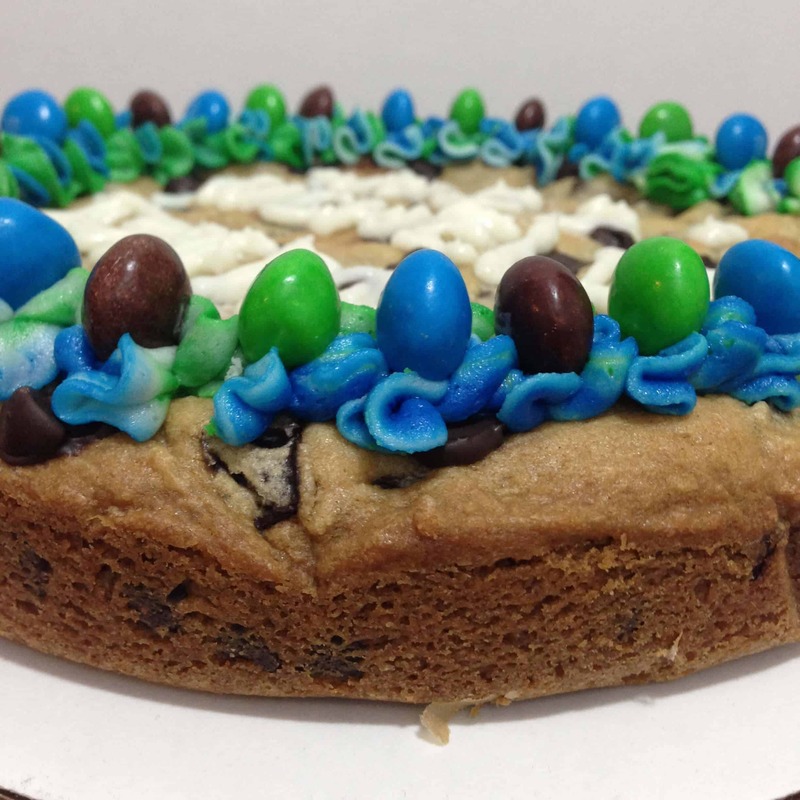 I though I had it all figured out when I made a double-decker, salted, brown butter, chocolate chip cookie cake, but I was mislead. While that cookie cake was delicious, I found a recipe I might like even more! It turned out perfectly chewy, and golden brown. 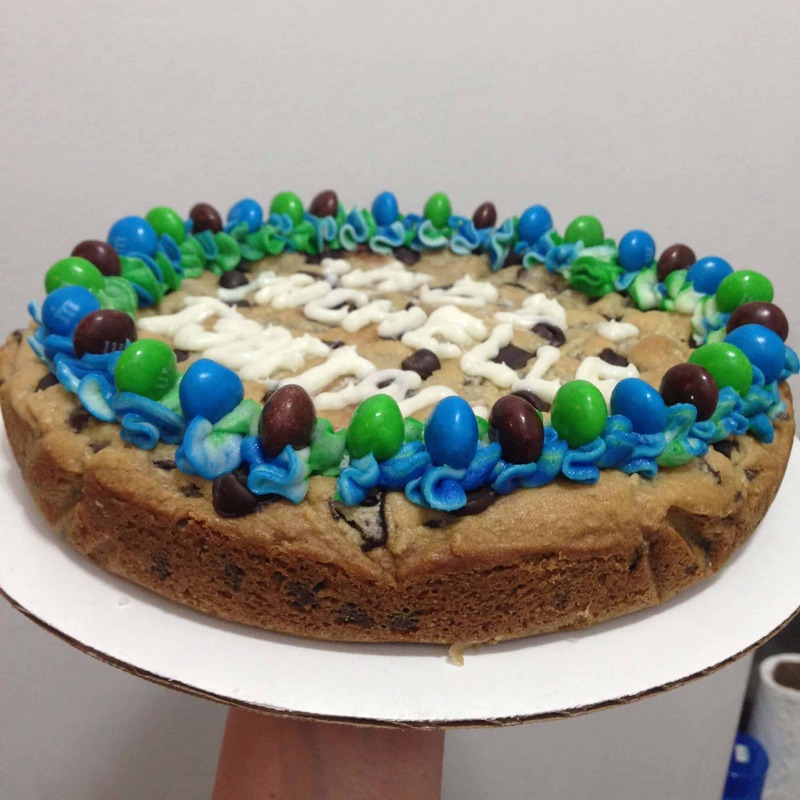 To make this cake even better, I stuffed the cookie cake with Nutella. It was a game changing decision. Preheat oven to 350 F degrees. Spray a 9-inch cake pan with nonstick spray. Begin by preparing the cookie dough. Using a hand-held mixer or stand mixer fitted with paddle attachment, beat the butter for 1 minute on medium speed until completely smooth and creamy. Add the brown sugar and beat on medium speed until creamy. Mix in egg, egg yolk, and vanilla on medium-high speed until combined. Use a spatula to scrape down the sides and bottom of the bowl, as needed. In a separate bowl, combine flour, cornstarch, baking soda and salt. Slowly mix the dry ingredients into the wet ingredients, at a low speed, until combined. The cookie dough will be quite sticky. Add 1 and 1/4 cups chocolate chips, and mix briefly until the chips are evenly disbursed. Press half of the cookie dough evenly into the prepared pan. Pour Nutella into the center of the cake, and spread over the cookie dough, leaving 1 inch of the edge of the cookie dough uncovered. Spread out the remaining cookie dough into a 9- inch circle, and place on top of the Nutella and cookie dough in the prepared pan. Gently press the edges of the cookie dough together, sealing in the Nutella. Press remaining chocolate chips onto the top of the cookie cake. Bake for 15 minutes. Remove and cover the cake loosely with aluminum foil to avoid heavy browning around the edges. Bake for 5-10 more minutes, then remove from the oven cool on a wire rack. Once completely cooled, use a sharp knife or metal spatula to loosen the sides of the cookie cake from the pan and transfer to a serving dish. As the cookie cake cools, prepare the frosting by beating the butter on high for two minutes using a stand mixer, until it is lighter in color. Mix in vanilla and salt. Add in the powdered sugar over two installments, alternating with splashes of cream. Once all the powdered sugar has been incorporated, mix in gel food coloring (if desired). Beat on high for two additional minutes, until the frosting is light and fluffy. Add additional cream (if too thick) or powdered sugar (if too runny) as needed to reach desired consistency. Use a closed star tip to pipe frosting swirls around the edge of the cake, if desired. mm this sounds so yummy. Thanks for posting this recipe..